? Guess who’s back… back again? Scottie’s back. Tell your friends… BECAUSE THIS ARTICLE NEEDS CLICKS AND I CRAVE THE ATTENTION! Well folks, the summer is coming to a close and I feel like I was hardly able to enjoy it (more on that later). So, let’s get this get this “5 Things” going so I can get some vitamin D before winter hits and daylight only lasts for, like, three minutes. 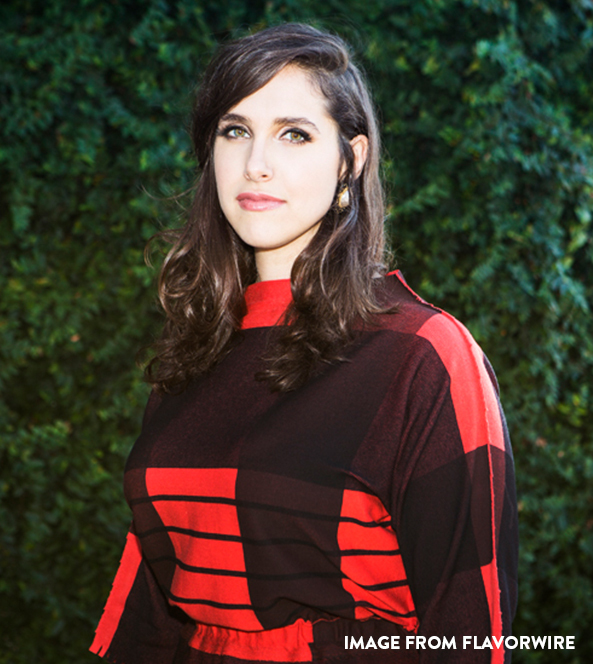 First and foremost, I feel like I need to get this out of the way: Megan Amram might be my favorite person that I’ve never met. Sorry you had to find out this way, Nobel Peace Prize winners and Dwayne “The Rock” Johnson. 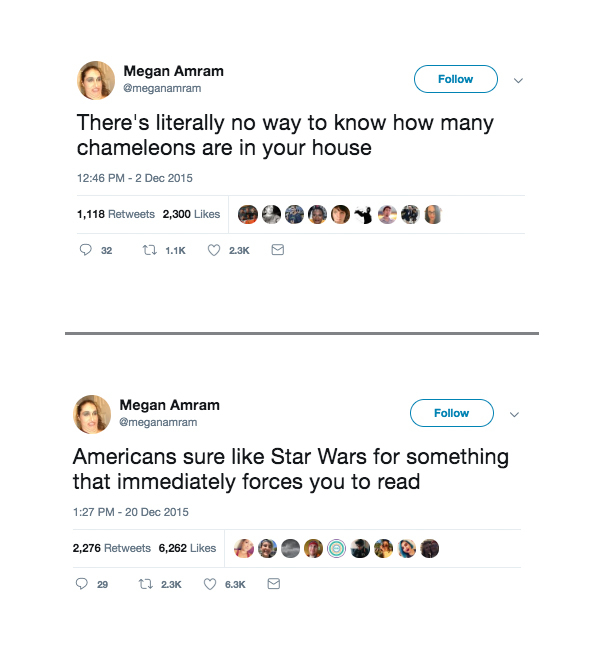 For those of you who don’t know (or as I shall call you “Aren’trams”), Megan is a comedic writer best known for her work on “The Good Place” (one of the best shows currently on television), “Parks and Recreation,” “The Simpsons,” and “Kroll Show.” She’s also the author of Science…for Her! and penned some of the funniest New Yorker articles ever written (truth be told, I don’t read many New Yorker articles. They’re usually really dry and tend to use big words that I don’t understand, so take this information as you will). But I, like most other people, discovered Amram through her Twitter account. Listen, some people are good at tweeting one-liners, some are great at it, but Megan Amram has legitimately perfected it. And her 1.1 million followers would probably agree with me. You don’t get that kind of following by posting pictures of food with “It’s lit” as the caption (that’s for Instagram). 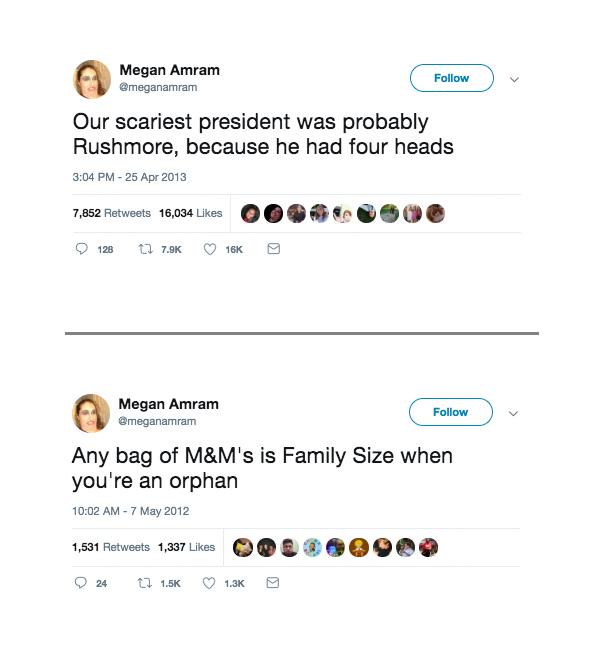 Seriously, if anyone in my office has heard me laugh out loud while I’m at my computer, chances are I just read one of her tweets. TV and Twitter aside, Amram’s quest for an Emmy might be her most fun and ambitious. As great as all of her shows have been, they have never won her an Emmy. So, she took matters into her own hands and created a six-episode web series that met all minimum requirements she needed for a nomination for Outstanding Actress in a Short Form Comedy or Drama Series. The show’s name, you ask? Oh, it called “An Emmy for Megan,” and whoo boy has it taken the Emmys by storm. It’s just amazing how she took it upon herself to earn a nomination (of course having over a million Twitter followers and including special guests like Ted Danson and Seth Rogan doesn’t hurt either). It’s really inspiring, and I hope I can utilize the same amount of grit and determination. I recently listened to a podcast featuring an ex-writer for “Saturday Night Live.” During the interview, he was talking about how it’s now so much more difficult to write commercial parodies because none of the top commercials are “sincere” anymore. 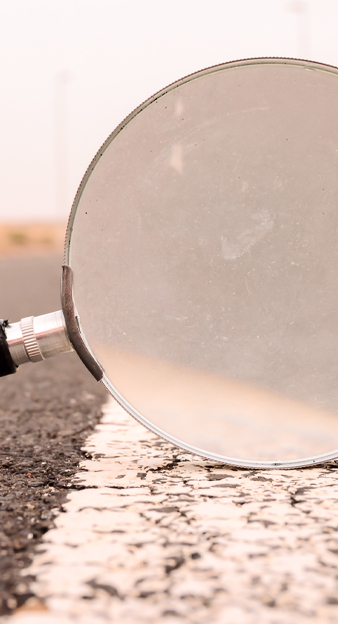 And though, many of us within the industry could point to a few brands or products where being honest and emotional still works, there’s no denying that “absurd” and “self-aware” advertisements are certainly on the upswing. And there’s no better example than fast food. Let’s take a look, shall we? First, I’d really like to start with Arby’s. To me (and clearly, my opinion matters the most here), this company has been cranking out some really great work. Most of their spots are completely copy-driven, tongue-in-cheek one-liners voiced by Marsellus Wallace himself, Ving Rhames (or “that guy in a hat from the ‘Mission Impossible’ movies” for anyone born after the 80s). Recently, this brand went truly “out there” with their “Arby’s Has Coke” stunt. To introduce such big news, they split the announcement into two parts. First, they made a teaser ad the size of less than 40 microns and placed it on a sesame seed and flew it to the largest city in America. Second, they printed another ad nearly five acres large and posted it in America’s smallest town. 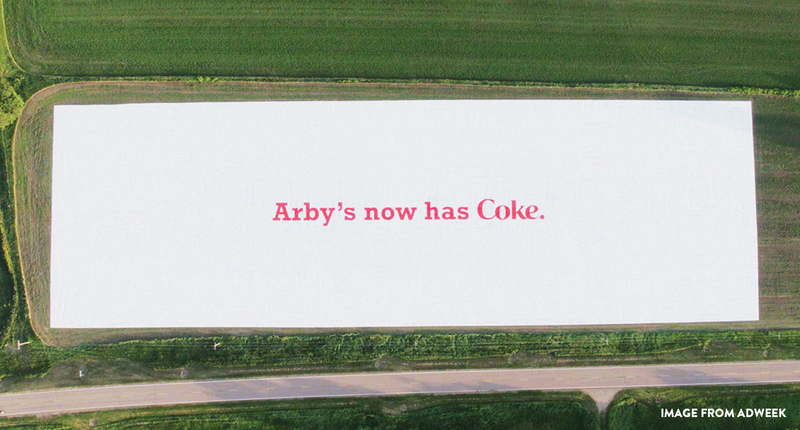 All of this, just to announce that Arby’s would now be selling Coke products. I guess setting two Guinness World Records isn’t the worst way to stick it to Pepsi. But if you’re looking for a fast food brand that’s completely going off the deep end, look no further than KFC. Whoo boy, are these guys going nuts. 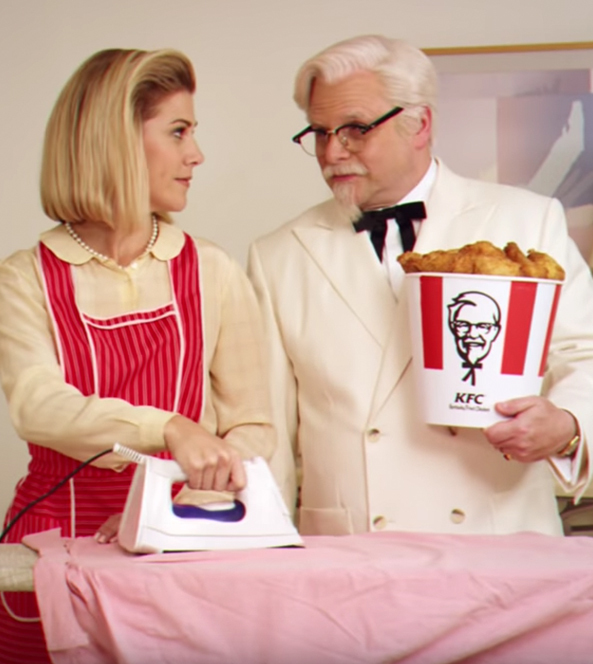 If you’ve seen any of their commercials lately, you might think it’s a little weird that they keep changing the actors playing the Colonel, and it is, but that’s just the tip of the 20-piece. 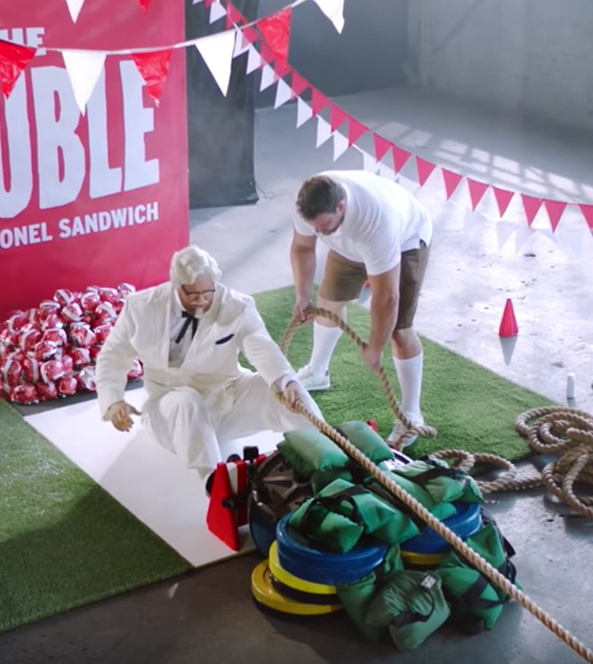 KFC hasn’t just dipped their toes into the absurd, they dove in bucket-first. Their “What’s for Dinner?” spot is basically an extended TGIF-era sitcom opening sequence with “Seinfeld’s” own Jason Alexander as the Colonel. To announce their Double Crispy Colonel, they hired Hafþór Júlíus Björnsson (please don’t ask me to pronounce it), AKA The Mountain on “Game of Thrones” to don the Colonel’s string bow tie and pull a cart filled with the new sandwiches (which also earned them a Guinness World Record). 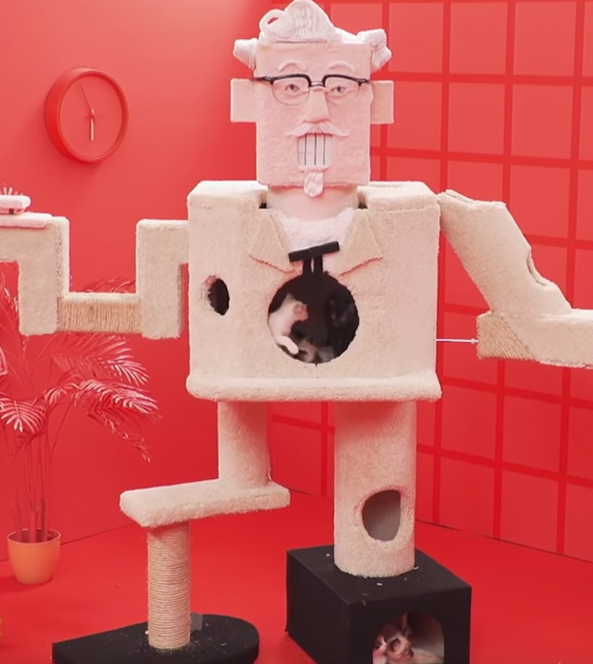 They even turned the Colonel into an interactive cat climber and live-streamed it for four hours (this is almost impossible to explain, you just need to see it yourself). There are bunch of other examples out there, including Wendy’s Twitter account, Jack in the Box and even the stuff we’re doing with Taco John’s, but this blog is already getting long-winded and I have three more things to talk about. Now, I know this set-up could easily lead you to believe that this story takes a dark turn real fast, but it’s totally fine. He then starts pointing the phone at the label, and after a good four or five minutes of what I call “old-man-fumbling,” the image on the label began to move and tell a story. When did my dad figure out how to use his phone? How did he manage to fumble around with technology for so long without swearing once? These labels are really, REALLY cool. In a nutshell, Treasury Wine Estates came out with a series of wines called 19 Crimes. Each bottle features the image of an old British convict who was sentenced to banishment in Australia for committing one of 19 crimes (get it?!). Now, initially these labels seem pretty generic for a wine company, but Treasury Wine Estates then implemented Augmented Reality (AR) to bring them to life. 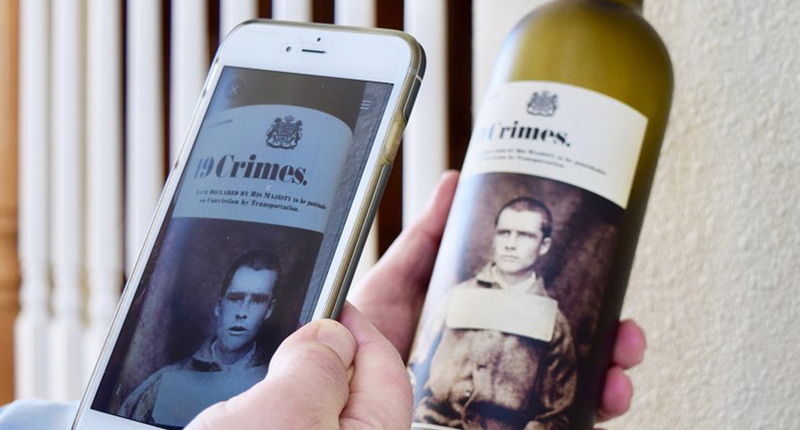 If you get their Living Wine Labels app and get rid of the old-man-fumbling, you can quickly see these old convicts come to life and tell their story. They are also coming out with a series of wines called Embrazen, which utilizes the same app but features the amazing stories of trailblazing women such as Nellie Bly, Josephine Baker and Celia Cruz. Yes, these wine labels are really cool, but more than anything, the reason why my interest was so piqued was due to the excitement of my father. The guy doesn’t get too excited over anything outside of a good golf score or a solid Western on TV. If a business was able to get someone like my father so giddy about modern technology, I know there is a lot to work with and it’s giving me a new realm of possibilities to look into. I’m going to level with you folks, one of the major downfalls of being a copywriter is the constant shroud of self-doubt that always surrounds you. “Is this the right phrasing?” “Is there a better word?” “Does any of this make sense?” “When will they figure out that I’m a fraud?” “Will I ever find love?” Every time we write something, we have to second-guess ourselves (this paragraph alone has taken me nearly 15 minutes to write). But recently, a Facebook page has helped calm these self-doubts. Cursed Commercials is a compilation of some of the world’s worst and most insane commercials. It’s got everything. You want to see a terrible Spongebob parody for a local motor company? It’s on there. Were you ever curious if Spider-Man would be a spokesperson for voting at the local-government level? Now you can find out. Has your death grip on nostalgia made you think anything Nickelodeon was perfect? Check out this commercial for the Super Toy Run. Listen, all-in-all, advertising is not an exact science. There’s a lot of trial and error. Sometimes we’ll strike gold with a brilliant campaign, other times we won’t. This page is here to remind me that even bad ads are great for something. I would like to take the last portion of this blog to write a brief love letter to my best friend all summer, my sciatica. Boy, this summer sure flew by, didn’t it? You and I were hanging out so much, it almost seemed like I was too busy wincing in pain and not sleeping to even enjoy the nice, warm weather. That’s ok though, at least you were there to keep me company. Hey, remember that time that I started working at that ad agency? You know, the job I’ve been working a very, very long time to get? I’m really glad you were with me to make sitting at my desk at said job nearly unbearable for almost three months. You know how to quite literally keep me on my toes. And I’d like to thank you for making it nearly impossible to focus on anything I was working on. That was also fun. Anyway, I hate to give you the news like this, but I probably won’t be seeing you around for a while. This probably isn’t forever (the human body has a tendency of being a trash heap after all), but maybe at least a couple of months. You see, my wonderful coworkers had intervened and told me that you were no good for me and gave me wonderful tips about leaving you and the people who could help. Even though we do have to go our own separate ways, I will never forget my summer with you. In the future, when people talk about the summer of 2018, I can be all like, “Oh yeah, I had sciatica almost that entire time. I don’t really remember anything else… EXCEPT FOR THE SCIATICA!” See? You’ve left your mark, and I’ll never forget you. P.S. I’ve changed all the locks on my doors. And there you have it, folks. Another long-winded rant about stuff probably only I care about. I hope you enjoyed it. I know I have. Until next time.